Email marketing remains to be the most effective tool for reaching both existing and targeted customers. In fact, 78% of consumers rank email as their preferred means of communication followed by social media at 57%. A well-crafted mass email campaign helps create a trusting partnership between you and your customers. Compare to mainstream marketing, it allows you to promote products and services without burning holes in your pockets. Although, bear in mind that there’s a huge difference between a working and inefficient email campaign. If you don’t know where and how to start a successful email campaign, here’s a list of top email marketing tips best applicable for small to midsized businesses. An ever growing email database is a sign of great accomplishment. Remember to prioritize quality over quantity. Sending an email to 100 targeted recipients will garner more positive results than sending an email to 1,000 random consumers. Offer creative ways to continuously improve your email lists. You may add a newsletter sign-up box on your website, enrollment rewards, coupon specials, contests and free giveaways upon entering a valid email address. Next on these email marketing tips is all about the email subject line. This is the first thing that your recipients will read so make it as compelling as possible. Your subject line should be interesting, convincing and irresistible but not to the point of turning off customers. It is advised to spill out your deals early in the subject line such as discounts, specials, promotions and member exclusives. Additionally, subject lines with fewer than 50 characters have higher open rates. Your email should have a good mix of content and sales pitch. Especially when sending business emails, a message with too much brand promotion is often deleted. Same as to messages overflowing with information. If you are having troubles finding the right mix of content, one of the best email marketing tips to follow is the 80/20 rule. 80% of the content should be useful to the reader while the remaining 20% should be dedicated to your sales pitch. More on these email marketing tips is the time when to properly send emails. Not everyone is widely awake 9-5, and not everyone is in the mood reading emails during the wee hours of the morning. In general, the highest opening rate – which is 21% occurs in the evening after dinner. Also, Saturday is considered to be the best day to send email blasts followed by Sunday. There are tons of email marketing tips out there but only few will tackle about transaction emails. Welcome messages, shipping information, delivery notices and account approvals are all forms of transaction emails – and they have the highest open rate. Don’t waste this opportunity and use it instead to pitch in additional goods and services. Example would be offering products in relation to their most recent purchase. As stated earlier, social media is the second most preferred means of communication. And next on these email marketing tips is the use of social media sharing buttons to increase online visibility. On the bottom of your email blast, add social sharing buttons such as Facebook, Twitter, Instagram, etc. This way, readers can easily share your offers and promotions with a single click of a button. Almost 80% of people read emails on their mobile devices. And if your email isn’t displayed correctly on smartphones and tablets, 71% of them will delete that message immediately. As with other email marketing tips, make sure that your emails are compatible on all platforms – especially mobile phones and tablets. Always choose a single-column design because it works well with vertical scroll. Moreover, make your buttons large enough to be easily tapped. Avoid spending lots of time crafting individual emails every now and then, harness the power of email automation. By using the best email marketing software, you’ll spend less time tinkering about your mail schedules. Email automation is particularly useful during holidays when everyone else including you is busy preparing things. Let the software do heavy things for you, all you need is an email marketing plan but make sure to stick with it to prevent last-minute emergencies. Following these email marketing tips is to consider offering opt-down rather than opt-out. The beauty of opt-down is that you’ll get to keep your subscriber, instead of tossing him out on your email database. While opt-out means unsubscribe, opt-down means you will still send consumer emails but in a more controlled frequency. When a person hits unsubscribe, offer him an opt-down in the form of receiving weekly, twice a month or monthly messages. Last on these email marketing tips is the importance of testing your email campaigns. Even if you buy email lists, there’s no guarantee that your messages will be delivered successfully. To ensure that your emails are perfect in all forms, always test your campaigns before sending them out. You can do this by using tools such as A/B testing. But you can also send them out to friends and employees and have them open it using different browsers, email platforms and devices. 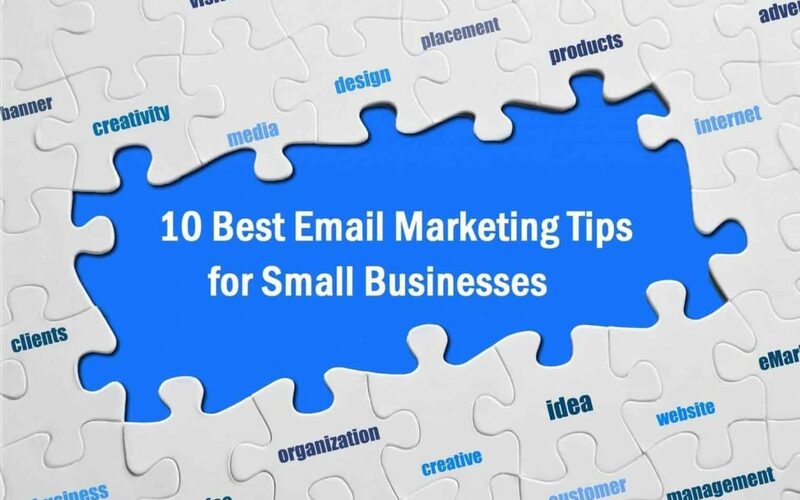 By following these top email marketing tips, improve the visibility, traffic and sales of your business in a simple yet effective manner. Email marketing is after all dubbed as the king of modern day marketing, so a well-executed email campaign should yield remarkable results.